The plan for stealing Arab water sources for the European Jewish settlements in Palestine was canonized during the WZO conference in 1893. The latest Jewish achievement of this anti-Arab agenda, is pro-Israel Ethiopian government’s construction of the so-called ‘Grand Renaissance Dam’ on the upper reaches of the Blue Nile which had been under construction with aid from the US and the Zionist regime for the last six years. It’s expected to be completed by the end of this year. Ethiopian dam, when completed will stand 170 metres tall (550 feet) and 1.8km (1.1 miles) wide. Its reservoir will be able to hold more than the volume of the entire Blue Nile, the tributary on which it sits (see map below). The dam is expected to cost over US$5 billion. After WWI, the Western Jewish groups called-upon the British Mandate authorities to talk to Cairo to divert some water from Nile river to new Jewish settlements in Palestine. The request was rejected by London as result of strong opposition by Egyptians. After the so-called ‘Camp David Accord’ between Israel and Egypt in 1978 – Herzl’s plan of ‘Nile water for Jews’ was put on the table again. In 1978, Egyptian president Anwar Sadat (traitor) declared in Haifa to the Israeli Jews that he would transfer Nile water to the Negev. Shortly afterward, in a letter to Israeli prime minister and former Jew terrorist, Menachem Begin, Sadat promised that Nile water would go to the occupied Jerusalem. During Hosni Mubarak’s presidency, published reports indicated that Israeli experts were helping Ethiopia to plan 40 dams along the Blue Nile. Egypt under president Mahmoud Morsi challenged the Ethiopian plan. On June 3, 2013, Morsi said during a cabinet meeting that “we have to take very serious measures to protect every drop of Nile water.” This turned Morsi into a Jew-hater, and was removed from power via military coup led by a Gen. Abdel Fattah el-Sisi, a Crypto Jew. The military coup was hailed by the US, UK, Israel, EU while Saudi Arabia and UAE pledged US$20 billion aid to the new military regime. 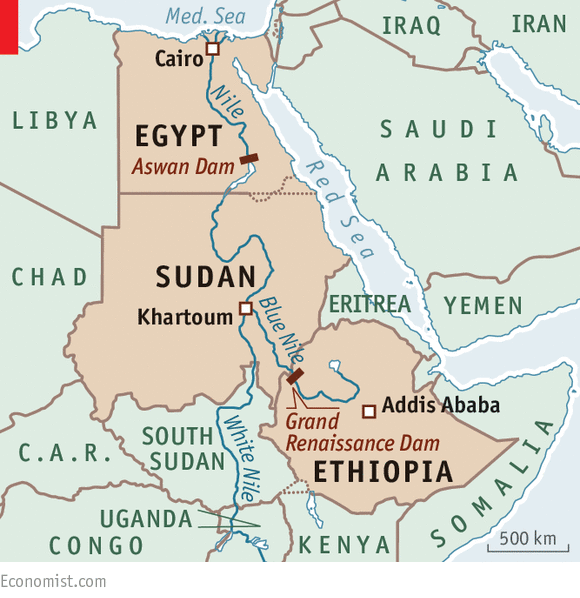 In March 2016, Egyptian military dictator Gen. el-Sisi, Ethiopian prime minister and Sudanese president Omar al-Bashir signed a declaration blessing the construction of the dam as long as it doesn’t harm Egypt’s Aswan Dam and the water needs of the downstream countries such as South Sudan and Uganda. “As Israel has expands and accelerates its wars of aggression, the wider implications of el-Sisi’s will reverberate throughout the region as serve-serving Arab leaders fight their own to execute Israel’s agenda,” says Soraya Sepahpour-Ulrich, an Iranian-born American political analyst and journalist.